While working in a cinema, Gintoki comes upon a "movie thief" (a figure in Japanese culture often depicted as a man with a video camera as a head, stand in as someone who illegally film in cinemas). After scolding the movie thief for his actions, he finds himself warped into another world via the camera lens. In this world, 5 years have passed, and not only has the land of Edo changed into an apocalyptic wasteland, but it is stated Gintoki has died. The movie thief, or Time Thief the time machine, explains mankind is close to extinction, and gives Gintoki an item to disguise himself. 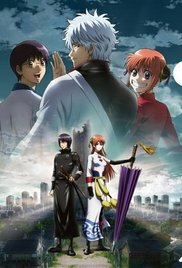 After the Time Thief is damaged by criminals, Gintoki encounters his freelancer comrades: Shinpachi Shimura, who has turned into a cool samurai with no trace of tsukkomi, and Kagura, who has changed into a beautiful woman with no Chinese speech pattern. The future's Gintoki is assumed to have died as a result of the "White Curse." Kagura and Shinpachi have been trying to deal with their leader's disappearance and Gintoki, disguised thanks to the Time Thief, tries to help them overcome their sadness. Read more on Wikipedia.